When it comes to dressing up your dog, several opinions exist. Some dog parents view dressing up your dog as a ridiculous activity. 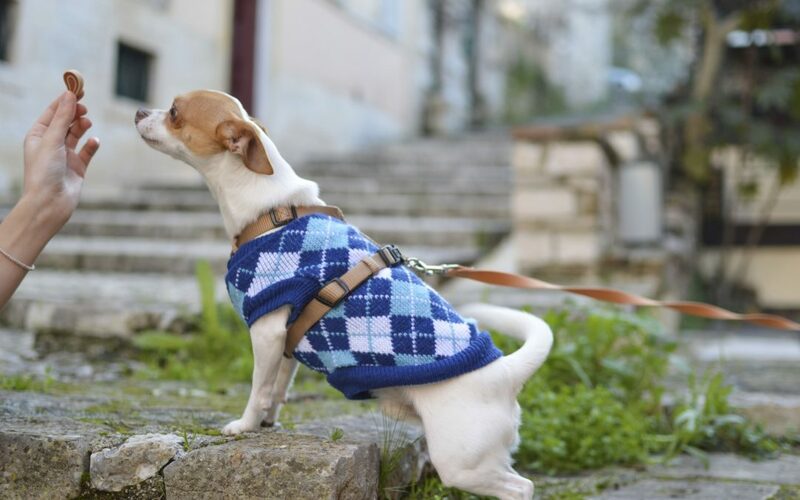 Others have a full wardrobe of clothes for their dogs. Personally, I think dressing up your dog expresses a lot about the dog parents and is an expression of their style. Sometimes dressing up your dog is more fashion statement than necessity; however, appropriate times exist when dressing up your dog. Dogs today are a long way from their wolf ancestors and are far too domesticated. Sometimes dressing them is a necessity for their well-being. Raincoats– Dogs, like humans, may catch the occasional cold and the responsible parent may want to take some precautions to avoid this. In locations where the weather is wet, dog parents buy raincoats for their pups. Along with how incredibly adorable they are in their shiny yellow raincoat, it’s necessary to keep all their fluff as dry as possible while out on a walk and getting their exercise. Weather Coats – The same goes with cold weather coats. Areas where the weather can get cold, a dog may need extra warmth where their fur may not be adequate. A dog can become accustomed and acclimated to their domesticated life and may need extra help in drastic circumstances. Also, many dogs are bred to be domestic pets and you shouldn’t be ashamed if your pup needs help to stay warm. There’s no shame with dressing up your dog to keep them warm. Dog Strollers – I was never a big fan of pet parents taking their dog out in a stroller. I saw it as a bit unfair that the dog did not get to enjoy their walk and exercise. That all changed after a few friends had to get a stroller for their dogs. I was able to broaden my views and be more open-minded. My friends explained they loved going to the dog park but the walk from their place to the dog park was too strenuous and long for their dog. They definitely want to provide their fur baby with some dog interaction and exercise at the dog park, but didn’t want to cause them harm on the journey there. Uncomfortableness – The comfort level of the dog is called into question. People wonder if the dog is uncomfortable or in pain by that cute little bow tie on their harness or the pig tail on the top of their cute, furry, head. They are concerned the dog is experiencing frustration since the pup cannot actually speak and see that the issue could be avoided. This might be a consideration or possible judgment you’ll face when dressing up your dog up like this. Hazardous – Some accessories can be a chocking hazard. Adding something unnatural to your pet can be dangerous because it’s a foreign item for them. Your dog can get stuck on something or choke on an accessory if not monitored properly. Humanizing – Some people treat their dogs like part of the family and others see them as a dog and lower on the totem pole — not on the same level as a human. When they see dogs dressed up with human accessories, they feel uncomfortable of the closeness that the dog parent has with their dog. They also feel that pet owners spend way too much financially on their dogs. Thanks for taking the time to read. I’d love to hear about your experiences with dressing up your dog. If you’d like to have a discussion, reach out to us on Facebook, Twitter, or leave a comment below.